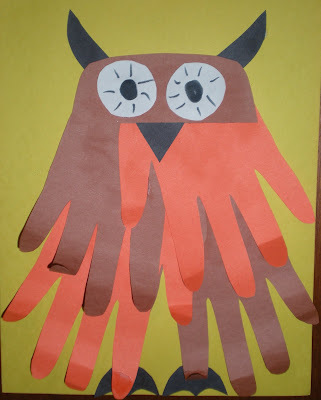 I found this really cute owl which I thought is great for fall or Halloween. 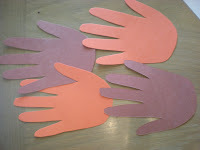 Glue the hands to a piece of construction paper. Only put glue on the palm part to of the hand. Overlap them so that the fingers will look like feathers. Next add a half circle for the head. I think my semi-circle is a little small, you might want to make it bigger. Glue this on covering the palm area of the top layer of hands. Now it's time to add the finishing touches. I made a "great horned owl," so I added some black horns. Then there was a beak and some feet. Finally, everyone knows that owl's have some great big eyes. I cut two white circles then added some detail. Glue the eyes on the head then go back and curl up the fingers to make them look like feathers. Now he's ready to spend a spooky night in the old oak tree. at last, an owl i'm not scared of! !